Move-in up until the end of April and get One Month's Storage Free. Offer ends 30/04/2019. New customers only. Selected sizes only. See in-store for terms and conditions. Conveniently located at 900 Pacific Highway in Lisarow we provide storage for all your needs. Whether it be Residential house hold goods, Commercial storage for those extra boxes or Professional Storage for all your archived documents, we will provide a professional and friendly service, at a competitive price. Nowhere to store your caravan? Leave your car unsecured for months on end? Why not leave it in the safety of our secured Storage King site. Need boxes or packing materials to store your goods? No problem, we provide a great range of packing materials at a great price. 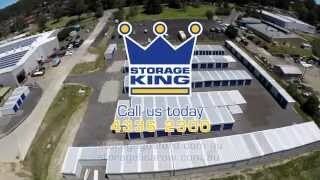 Storage King Lisarow proudly services Ourimbah, Gosford, North Gosford, Niagara Park, Narara, Holgate Erina Heights, Wamberal and Wyoming.